Can you guys believe I'm writing to you all from 20,000FT above sea level and rising?! It still shocks me how far technology has come these day. This is the third and final look from my Arizona trip (yay! ), with its photodiary/vlog coming soon. 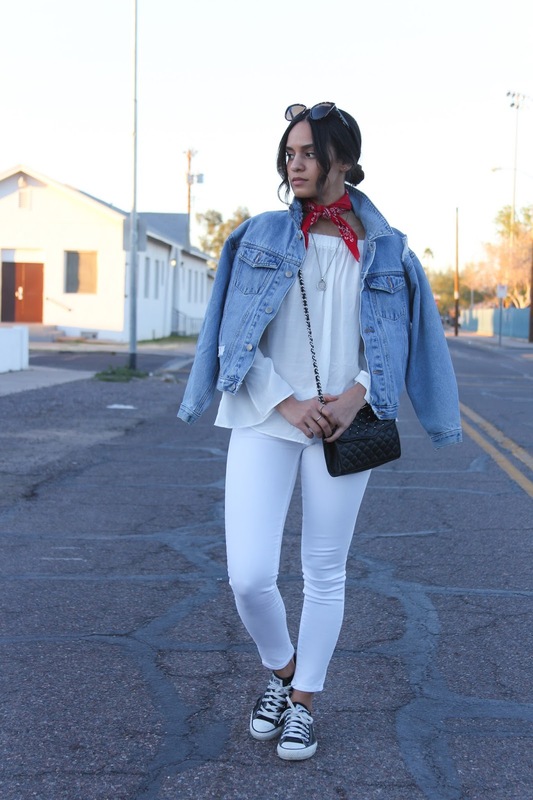 We were trekking from chilly Flagstaff to sunny Phoenix that day so I went for layers that would keep me warm in the morning but I could easily peel off when the heat became unbearable. 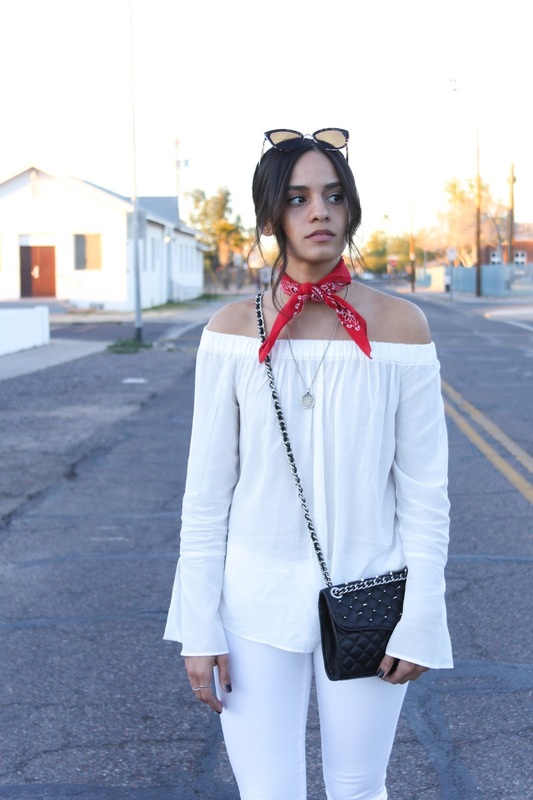 Of course it wouldn't be a trip out west without paying homage to the popular neckerchief/bandana that seems to have taken over street-style this past year. I wanted to flirt with the trend without fully committing so I replaced my cowgirl-esque booties for some converse and threw on my cat-eye sunnies and studded cross body for good measure. This is a look that you can easily take from running errands to bar hopping with your gal pals by switching out the sneakers for some chunky heels (like these) and adding a dab of rouge. I really like the way you give a colour touch with the red bandana. Great outfit! 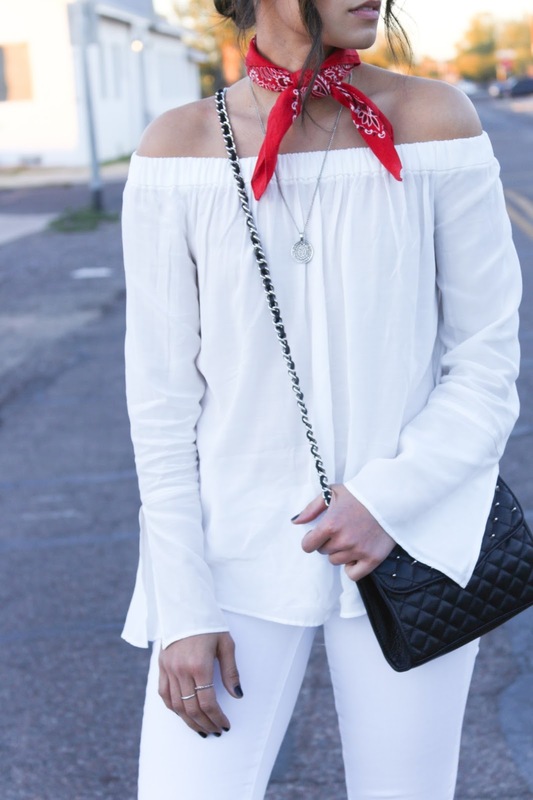 Loving the off the shoulder shirt. Perfect look! 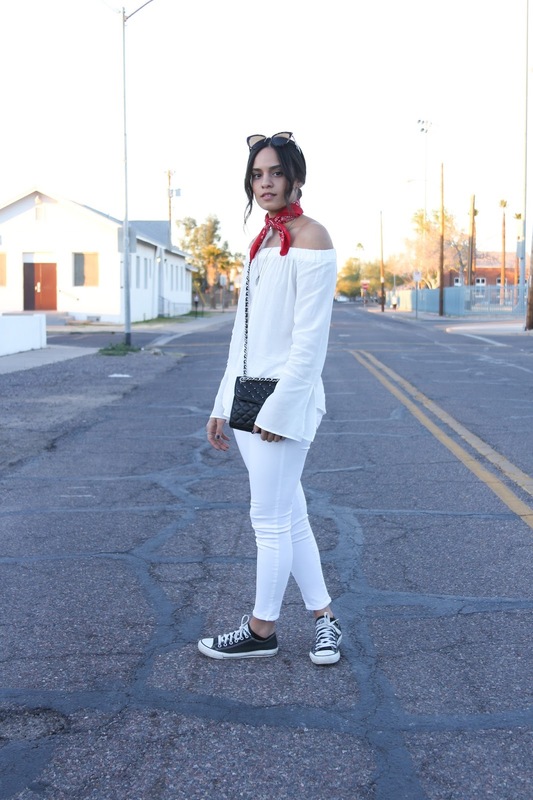 Keeping it toned down with the converse is a good choice. I'm about to jump on that bandana bandwagon too! #saynotoneckwrinkles! You look beautiful! I wish I could spend my vacay in Mexico some days! Loving this look for the classic elements blended with trendier touches!! That blouse is lovely!! This is amazing look! Love it! Happy Wednesday! Thank you Len, happy Wednesday to you too! I seriously love this look, you rock that bandana! 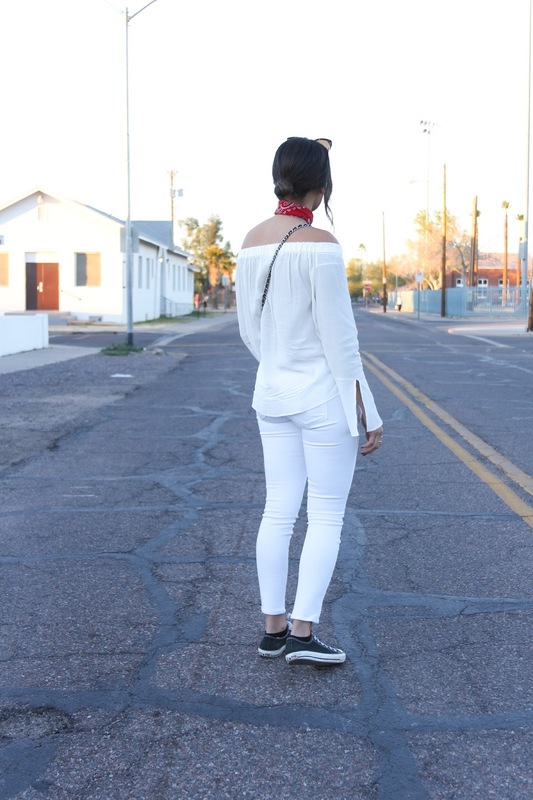 I've wanted to try out this trend coming back for a bit now so I think I'll go for it too and pair with the all-white since it looks so good on you! P.S: Love the lace-up dress in your last post! Super fun outfit and you look beautiful! Lovely outfit! 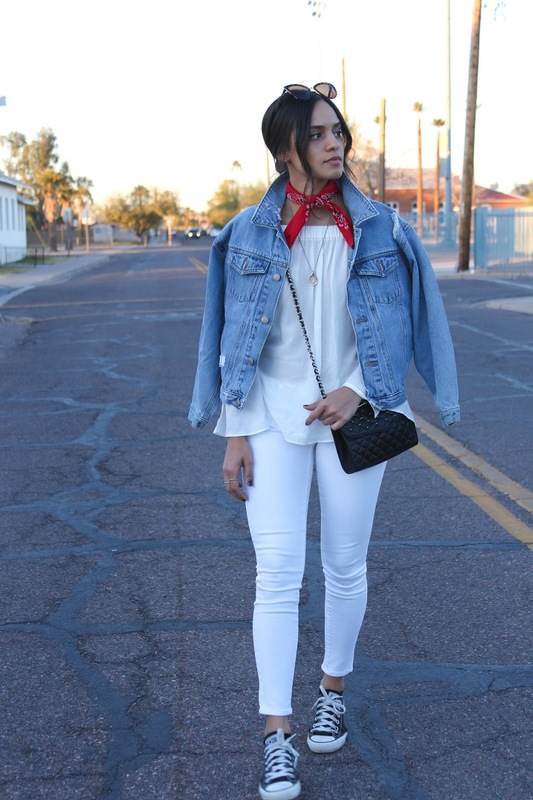 White pants for spring and summer is so stunning! I'm so in love with this look. Loving the idea of topping it off with those denim jacket! Thank you Karen! I love to throw a jacket over everything. loving this look so much! the denim jacket is amazing!